We chose to transform the tradition of good handmade things into street food: fast and economic but also healthy, tasty and mostly for everyone. Also for vegan lovers and for those who have to give up gluten or sugar. Here everyone can find healthy food, tasty and suited to their dietary needs. Why don’t we have a window full of sandwiches, salads or ready-made things? We prepare “espresso”, ready-made on the moment, and this means fresh ingredients, additive and artificial colouring free and, above all, chosen by you on the spot. Our Piadine, Tigelle and Focacce are handmade, made according to tradition: flour, water, oil and natural yeast… simple, healthy, Italian. Fried foods have 50% less fat thanks to special machines frying with no oil. Eggs and vegetables are steamed and, while maintaining their taste, they are not overloaded with extra-oil and fry-ups. What is not made by us, is produced by small artisans who provide us with quality and freshness guaranteed products. We transform every moment you dedicate to food – either breakfast, a fast lunch or a simple break, or a relaxing dinner in a pleasant and nice memory. Download our general menu! Download our celiac menu! Download our vegan menu! Ask for the VIP CARD: a personal card, free, self recharging! Every euro spent at SanoItaliano will charge you 1 point. On reaching 50 points, you will have a €-5-discount! Furthermore ,there are a lots of dedicated promotions . Fill in the form at our restaurants and you will immediately start recharging! Download order and fill it in before coming: we will serve you more quickly! We also offer take away service!! 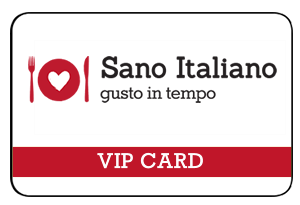 Bring home the taste of Sano Italiano. We use only biodegradable and compostable tableware and packaging , made of PLA ( polylactic acid) and sugarcane pulp; plates, glasses and cutlery , are thrown away together with the remains food remains, so they will become soil fertilizing compost. A choice costing us something more but definetly worthwhile. Also Sano Italiano’s cafeteria is environment-friendly, organic, fairtrade thanks to Caffè Pascucci products, whose quality and excellence are certified. To learn more click here. We chose recycled paper for our prints and Eco Natural Lucart paper for our customers: a paper not made from cut trees but recycling a material (Tetra Pak) that would otherwise be lost in landfills and so giving a hand to correct waste disposal. To learn more click here. Or watch the video. Our cleansing agents are Green Care eco-friendly ones: made with renewable raw materials ( eg . Wood, vegetable oils ) and not harmful bothfor the environment and for people using them. Why don’t you start a ‘Sano Italiano’? You put your enthusiasm and your strong will, we’ll guarantee a support to achieve your business. If you want to jump into this venture we’ll give you a hand: we’ll share the investment and our expertise will be available in order to reduce risk and speed up start-up times. We offer you: brand, business model and an organizational system suitable for locations from 60 square meters up, training, marketing (logo, site, indoor and outdoor furniture, uniforms, flyers and gadgets).